The Sinn Féin President Mary-Lou McDonald has said the Derry she knows is that of the Clipper festival, the Foyle Cup, and Féile, and not that being projected by those using 'young people' as 'cannon fodder' to further their own 'failed political and personal agendas'. Ms. McDonald, speaking in the Gasyard this afternoon, described the events of the past week as a "sustained attack on this city and the people of this city". Sinn Fin President Mary Lou McDonald at the Gasyard this afternoon, accompanied by, from left, Gerry Kelly MLA, Elisha McCallion MP, Martina Anderson MEP, Raymond McCartney MLA and Karen Mullan MLA. “As political leaders, as community leaders, as trade unionists, Church leaders, business people and as citizens of this beautiful city, we must stand shoulder to shoulder and demand an end to it," she said. “It is the city of Civil Rights and in such a place, sectarian attacks should not be aimed at anyone," she added. 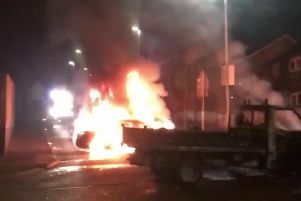 Standing perhaps 250 metres from where automatic rifle fire was aimed at members of the PSNI on Tuesday night and where well over 200 petrol bombs have been hurled at police over the course of the past six nights, she said those responsible for the disturbances were victimising their own people. “We need to send a strong message to those responsible that they do not act in our name. That they will not succeed," she said. The Sinn Féin leader said the image being presented of Derry on news bulletins in Dublin, Belfast and London was not that of the city she knew. “That is the Derry we all know and love. And standing together tonight, we will send a strong message that we will not allow anyone to destroy that or drag us back to the past," she said.